During this tour, you will have the chance to visit the popular Golden Triangle cities in China – Beijing, Xian and Shanghai. What’ more, the colorful Yunnan and mysterious Tibet, as well as the Liver cruise, will leave you a lifelong memory. Explore the history and culture of China by visiting the famous cities – Beijing, Xian and Shanghai. Get close to the roof of the world – Tibet and feel its strong Buddhism atmosphere. Enjoy the spectacular views of Longji Rice Terraces, Liver and Yangshuo Countryside. Visit the Summer Palace in the morning, which used to be the summer resort for royal families and emperors. In the afternoon, walking along Beijing hutong alleys, narrow but original. Then fly to city of Xian. A local tour guide will pick you up at airport and transfer to your hotel. Free time until being escorted to airport to take your flight to Lhasa. Upon arrival, local tour guide will pick you up and transfer to your hotel. 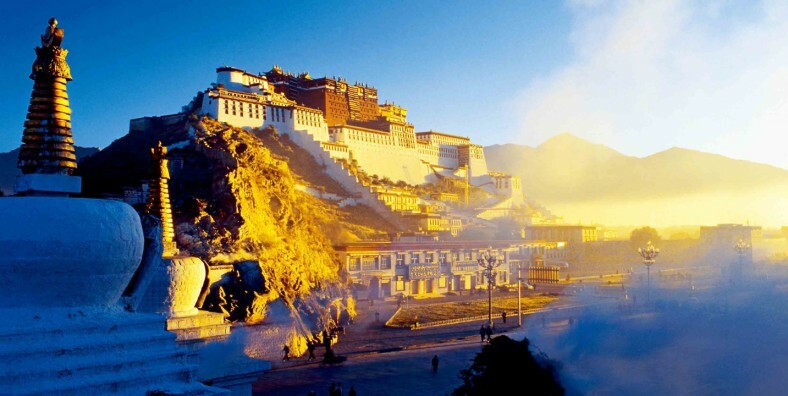 After breakfast at hotel, the Lhasa tour begins with the must-see attraction – Potala Palace, the largest monastery of its type in the world and official home to Dalai Lama. Then move on to Jokhang Monastery and walk along the Barkhor Street nearby. Enjoy the local Tibetan culture here. Morning, drive about 4 hours to Shangri-la, the legendary lost paradise. After arrival, head to Dukezong Ancient Town for a visit. Today drive another 4 hours to Lijiang. Then visit Ancient town of Lijiang and stroll on Square Street. In the morning, be escorted to take the train to Kunming. Then head to visit Western Hill & Dragon Gate. After the tour, if time permits, have a short visit to Yunnan Ethnic Villages. In the morning, be transferred to Kunming airport for your flight to Guilin. On arrival, met by the local tour guide and transferred to your hotel. On the way, stop at Reed Flute Cave for a short visit. After break, head to Longsheng County. It features rich and elegant folk customs. The we will arrive at Dragon’s Backbone – Rice Terraces. It was reputed as “an absolute one under the heaven and the first one in the world”. After lunch, visit the villages of Yao people and Zhuang people to experience the ethnic cultures and lifestyle. After the visit, drive back to Guilin for overnight. In the morning, drive to wharf for the Li River Cruise. Enjoy the amazing scenery along the Li River and disembark in Yangshuo. Then walk around West Street, the main street in the downtown Yangshuo area. In the evening, enjoy the night show of Impression of Liu Sanjie(optional). After breakfast, tour the countryside of Yangsuo by bicycle or private car to get close to nature. We will visit a village and you have the chance to talk with local people with the help of our guide. Then drive back to Guilin to take your flight to Shanghai. Today walk along the famous Nanjing Road and the Bund. Nanjing Road is China’s premier shopping street with the length of 5.5km. The bund is a famous waterfront and regarded as the symbol of Shanghai. Then we will wander Yuyuan Garden and head to the Jade Buddha Temple, which is a venerable and famous Buddhist temple built in 1928. Then continue our trip to the Oriental Pearl Tower. The ultra-modern Oriental Pearl TV Tower combines ancient concepts with 21st Century technology, where you can get a bird-eye-view of whole Shanghai city. After all the visit, be transfered back to your hotel in Shanghai. Today your wonderful China tour will complete. Be escorted to the airport and service ends.